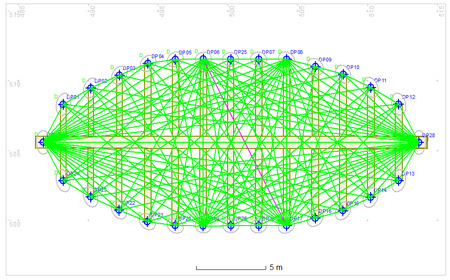 An alternative to using the Control/Detail method that used to be used for 3D trilateration surveys is what can be called the 'Everything' network. Here there is no distinction between Control Points and Detail Points and every survey point is measured to many of the other survey points nearby. This design of survey point network should not be used. A good example of this is the network shown below in Figure 1. The timber frames on the shipwreck have been mapped and used to draw the site plan; 48 points positioned with more than 500 distance measurements. The resulting network shape is pointed so the position accuracy on the right side of the plan will be poor compared to the rest of the site. The survey points are all on the structure itself. If any of the structure erodes away or moves then much of the network will be destroyed. if the site is re-surveyed at a later date the changes will not be easily measured and the a lot of the original work will have to be re-done. But the biggest problem would have been seen when processing the results as just one bad measurement can alter the network shape completely. 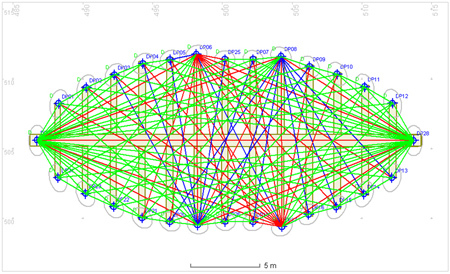 A simulation of a similar Everything network is shown in Figure 2, the magenta line represents one bad measurement added to hundreds of good measurements. 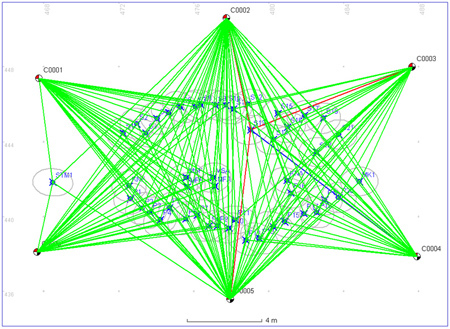 Figure 3 shows the same network after the measurements have been adjusted to calculate new survey point positions. The green measurements are ones that are considered to be good, the red are too short and the blue are too long. Because all the points are connected to each other with distance measurements the single mistake measurement has distorted the whole network so much that its impossible to tell which one is the mistake. 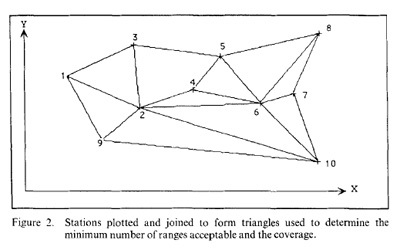 This survey method used to have a reputation for being difficult to process and the reason was because Everything networks were used rather than the Control/Detail method. Figures 4 and 5 show the same shipwreck mapped using the Control/Detail method. Figure 4 shows the six control points, 11 distance measurements and six depth measurements that are required. 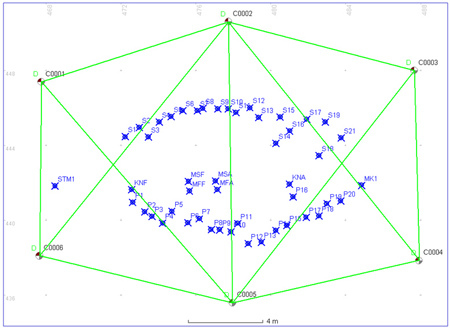 Figure 5 shows 48 Detail points, each positioned with four distance measurements and a depth. 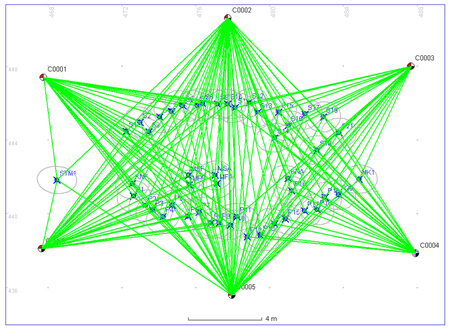 In total this required just 203 distance measurements, less than half that were used in the Everything network. But the main benefit of the Control/Detail method is the ability to find mistakes in the measurements, and typically between 5 and 15 percent of the tape measurements will be mistakes. When positioning Detail points using a Control network any bad measurements will only affect the position of the Detail point they are made to, mistakes do not affect the positions of Control points or any other Detail points. Figure 6 shows the effect on the measurements of adding just one bad distance measurement to a Detail point, only the one Detail point is affected and all the other measurements remain green showing that they are good. In practice this is even simpler as the automatic measurement rejection tool in Site Recorder would find the bad measurement and not include it in the solution. This also illustrates why measurements should not be made between Detail points as this would convert a Control/Detail network into something like an Everything network, making it much harder to find mistakes. Associated with the Everything network is the Triangle network, another network shape to be avoided. Instead of groups of four points forming braced quadrilaterals of six distance measurements, the survey points are grouped into threes making triangle shapes. This is effectively a group of four points with only five measurements between them so the sixth, crucial check measurement is missing. With the essential check measurement missing there is no way to calculate how well the distance measurements fit together. If one of the distance measurements in the triangle is a little too short or too long then the three measurements will still form a triangle, just one of a slightly different shape. Putting lots of triangles together in a network will help calculate positions for the points but it is hard to know if any of the measurements are errors. It is likely that the design in Fig. 7 came from a misunderstanding of how distance measurement adjustments work; a confusion between two different methods with similar names, triangulation and trilateration. In early papers and books referring to surveying with tape measures the term triangulation was sometimes incorrectly used. The triangular network design will work for instruments that measure angles such as a theodolite, these instruments used to be in common use in land surveying. Similar, triangular network shapes can be found in books about engineering surveying in the sections about using a theodolite. Triangulation, the measurement of angles for surveying, requires that all three angles in a triangle add up to 180 degrees so you can assess quality by calculating how far from 180 degrees the sum of the angle measurements are. Trilateration is the measurement of distances for surveying and the adjustment of this type of measurement uses very different mathematics from triangulation. If you replace the angle measurements with the distances it is possible to calculate positions for the points but with very little information about the quality of the positions. This also forms an Everything network with all of its associated problems, see above.